Since summer time, aka grilling season, is right around the corner we've been recipe developing to create a gut-heathy & grillable veggie burger. I know I'm not the only one whose veggie burgers usually fall apart on the grill... Sandwich like foods are notorious for being ugly in photographs, so in order for these blog pictures to be colorful and beautiful, we added shredded beets. 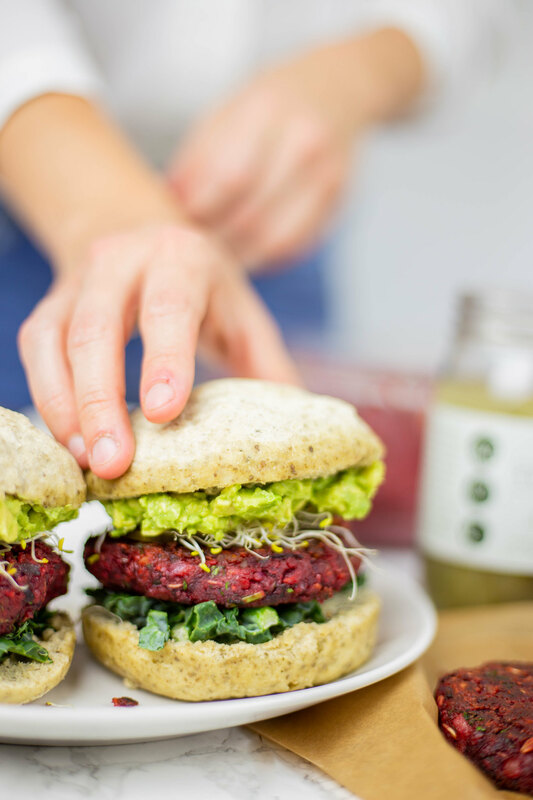 These turned out to be the best veggie burgers we've ever made! Scotty even want's to make a bunch of them to stick in the freezer for quick lunches. Obviously we used our Fermented Dill Pickles as a topping, adding billions of gut healthy probiotic bacteria! Combining the right ingredients in the right ratios to form a vegan burger patty that doesn't fall apart is hard... but not with this recipe! We cooked these burgers in a cast iron skillet AND outside on the BBQ grill... and they stayed together, in cute, vibrantly colored little patties. For the toppings you can get creative! We added chopped kale, avocado, dijon mustard, sprouts and pickles. With our Cultured Guru Pickles included you get Over 200 billion CFUs of probiotics in this dish. We ate these for the first time on some little gluten free buns I made... It was DELICIOUS! I had some patties left over and grilled another one on the BBQ grill for Mother's Day. I topped it with onions, Cultured Guru Pickles, lettuce, tomato and dijon mustard and then ate it in an iceberg lettuce wrap... Y'all. IT WAS SO GOOD. I think I may have liked it a tad better with the traditional burger toppings. Need a prefect side for grilled veggie burgers? Try out our Vegan, Healthy Potato Salad Recipe! It's the perfect light side to pair with a healthy burger. Mix all of the beet burger patty ingredients in a large mixing bowl. If doing this by hand, use gloves to avoid the beets staining your hands. Once you’ve mixed the ingredients well, it should be the consistency of chunky cookie dough. Form into medium sized balls and pat down into burger patties. Preheat your skillet or grill. Once hot, grill on well greased surface until both sides are slightly browned. Dress your burger however you desire and enjoy! Don’t forget to add some Cultured Guru Pickles for probiotics and delicious flavor!